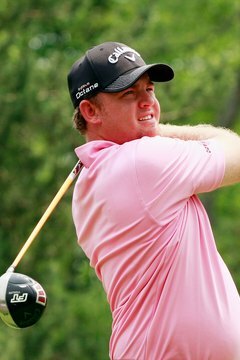 J.B. Holmes is one of the longest hitters on the PGA Tour. The average driving distance among golfers in the PGA varies from event to event and from year to year, but typically stays within a few yards of the same number. Players such as J.B. Holmes, Bubba Watson and Dustin Johnson are perennially among the longest hitters on tour. Through the first week of December 2011, the average driving distance on the PGA Tour was 290.9 yards. The PGA tracks the driving distance of every player on every drive and compiles all this data to release year-to-date statistics following each tournament. Regardless of the year, an average driving distance of around 290 yards is typical. Holmes led the field with an average drive of 318.4 yards, as of the first week of December 2011. Watson and Johnson sat in second and third place, with averages of 314.9 and 314.2, respectively. Robert Garrigus and Gary Woodland rounded out the top five. Twenty-one golfers had average drives of at least 300 yards. Having a long drive off the tee does not necessarily yield success on the PGA Tour. Several notable players are not among the top 20 in average driving distance, yet have won major tournaments and/or contend on a regular basis. Phil Mickelson averaged 299.8 yards per drive in 2011, while Adam Scott was just behind at 299.8. Sergio Garcia averaged 299.2 and Ernie Els averaged 288.1 yards. Tiger Woods averaged 298 yards per drive in 2000, arguably the best season of his career. Although driving statistics haven't been meticulously kept throughout golf's history, Jack Nicklaus routinely hit drives well over 300 yards and was always among the tour's longest drivers. When Nicklaus played, golf clubs and balls weren't as technologically advanced as in today's game. A player's driving distance is partly at the mercy of environmental considerations such as wind. On a windy day, gusts can carry a player's ball away from the fairway. Thus, he might opt to play a short, safer shot to avoid the ball getting caught in the wind. Depending on the layout of the hole, some players don't always hit the ball as far as they're able. Strategically, it is often advantageous to lay up.